Edgar Allan Poe- a man whose own life was shrouded in just as much darkness and deceit as his infamous stories and poems. I've always enjoyed a bit of Poe, feeding into that side of me that revels in the sweaty palms and nervous glances at the wardrobe and under the bed, that were kicked off by the likes of Are You Afraid of The Dark? and Goosebumps. 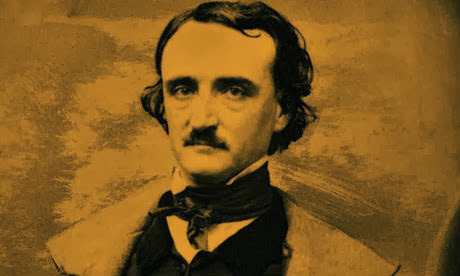 I don't know what that says about me, and of course Poe's talent for creating the most morbid and gruesome of narratives has lead to a lot of academics looking at the man's own mental stability, but I think there's a lot to be said about a man whose stories can still make your skin crawl over 200 years after they were originally written. One of his most well-known stories The Tell-Tale Heart has always stuck with me; the old man's glass eye peeping at the young man, who already admits to having a nervous disposition, and leading him to dismember a corpse and hide it under the floorboards. A pretty horrendous image to have in your head as a fourteen-year-old, and to be honest it doesn't get any sweeter as you get older. Poe by all accounts was a little bit freaky-deaky when it came to women. He married his thirteen-year-old cousin when he was twice her age with disputes over whether or not the marriage was ever consummated, and memories left by his ex-girlfriends suggest that he always seemed to be on the edge, with too much going on in his brain for even the man himself to handle. 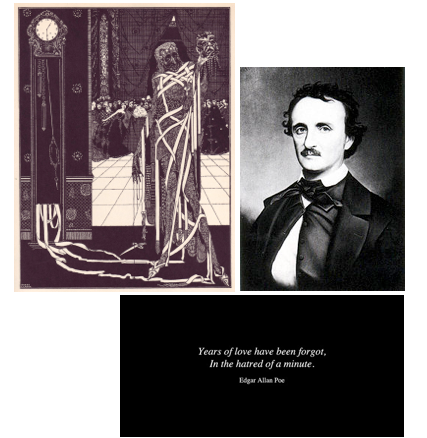 Ligeia, another personal favourite, deals with another popular Poe motif; the beautiful young woman who dies far too early, and then comes back again all corpsed up and looking for some form of revenge or atonement. I have to admit that on a darker more side, I was also a bit happy to be reading about a beautiful woman with raven hair and unusual features who manages to take over the body of the blonde haired, blue eyed second wife. Poe excelled at delving into the dark recesses of the human mind. Our imaginations, desires and weaknesses. That's why his works are still enjoyed today, and still found worthy of television and film adaptions. In a time where there seems to be no limits to where Director's will go to terrorise their audiences, Poe attacked a far subtler and deeper aspect of human nature.